I have. Love the PMs. Sure, but are jellies really strangers? After almost three years around here I suspect we are at least acquaintances. I had a chat once with an old man named Herbert. He mentioned I should stop by his place because he has some popcicles in his basement. 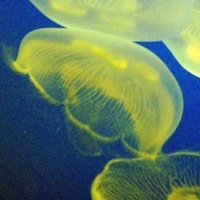 @fundevogel You can have a PM chat with a new jelly. Yes :-) I’m making more effort with initiating PMs too… want to feel like I belong! I talk to random strangers in real life all the time. It’s fun. I had a conversation about manifest destiny with a Pakistani girl I had never met the other day, for instance. Yes, I had conversations with quite a few strangers last night at the Breaking Dawn Part 1 midnight premier. You know, talking to other people in the popcorn line, and so on… VERY long lines, so everyone there pretty much starts chatting with other movie goers while they wait. Yes, several nice PM’s from jellies on here and a few nice customers at work who complimented my wedding rings. Despite the stereotype, people in NY are friendly and chatty (once you start seeing the same faces every day). There’s a small handful of people I’ve met on the bus on my way to work and we’ve become acquaintances. We had a Chatty Kathy who came to our yard sale and sat down and had a conversation for over an hour. She didn’t buy anything. I like talking to new people via PM. I had a nice conversation with a stranger a few days ago after they commented on my tattoo. Agreed. I don’t generally seek people out privately, but it is a nice surprise when I receive a message. I often PM new users, and they reply back. It soon turns into an enjoyable convo. I had two PM’s from sweet jellies who missed me. I had more friends on sodahead than here but even then there were only a very few that I would chat with in PM’s. It was usually about them agreeing with me on a topic that was important to them. @WillWorkForChocolate aww… Y’all bout to make me tear right up. I like drive by hi-ing people, users I know/am friends with, newbies or people I just don’t know. @redfeather Good. Cry it out and stay with us! Oh, my darling, @Symbeline :( ..... I miss you guys, damn it. Get a room guys. Oh okay, you can use this one. Hugs. @Symbeline Yes, get the chains! Then we can keep her here with us forever!! I love PM’s and made a lot of my jellyfriends through PM’s! I rarely talk to strangers IRL, though. How important for you is it to know the gender of the jelly with whom you are conversing here? Why don't jellies come to chatrooms? Did you know that we're having a Town Hall meeting tonight on Fluther?